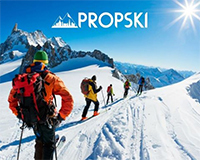 Disruption is an important part of the evolution of the property industry and gives choice to the people who want to live and work in London, an audience heard at Question Time Propski yesterday. Nick Cuff, land director of Pocket Living, which develops compact one-bedroom flats for middle-income-earners in the capital, said disruption was a “great place to be” and has given rise to valuable businesses. Cuff, who used to work as a planning executive at Wandsworth Council, seeing through the regeneration of Battersea Power Station and Nine Elms, was speaking to industry representatives during the annual property networking event in the French Alpine resort of Tignes. When asked to “right swipe” to agree or “left swipe” to disagree with the statement that knowledge of how things have always been done can be a handicap, he replied that “being different is important”. He referred to his background in politics, and also the non-traditional background of Pocket chief executive Marc Vlessing, who used to work in the film industry, as integral to seeing the inefficiencies that exist in real estate. Also speaking on the panel, Tom Redmayne, UK business development director at connectivity certification company Wiredscore, said the role of the property surveyor would shift dramatically over the next five years, and see them play a greater consultancy role. “When I worked at Cushman & Wakefield, my big client was Derwent London. They said to me ‘we’ll do the deals, but we need you to be our eyes and ears for what’s going on in the wider market’, and I think that is going to happen much more,” he said. Predicting future trends, Redmayne said that 5G would be a major part of the infrastructure narrative this year, enabling internet users to download a film in seven seconds that would usually take seven minutes. However, he said developers would have to think about putting the right level of infrastructure into their buildings to enable the use of 5G, which does not travel through walls and glass as well as 4G due its high frequency.